Welcome to Day #3 of Chocolate and Surprise Theme Week. Just when it crossed my mind that maybe 11 years of chocolate might be enough, surprise! This generous gift from a friend arrived. 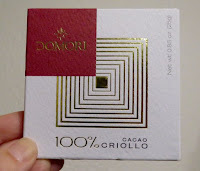 Today's single-ingredient,* 100% Criollo Cacao bar from Domori (None, Italy) was purchased by said friend at an Apple Computer store adjacent to the company's Cupertino headquarters. Disk drives and Domori. Interesting combination. This bar had a slightly bitter, earthy tobacco aroma. 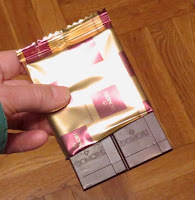 The relatively thin bar allowed access to a flavor profile (similar to the aroma) right away; and the chocolate broke with a had snap (a sign of a well-tempered bar). The melt was rapid and even; and the texture was smooth, almost creamy. For such a powerful dark aroma and flavor profile, it was surprisingly mild in terms of bitterness and lacked the astringent pucker one might expect. It was like a ship in heavy seas that you expect might founder but it kept miraculously righting itself. The flavor was very even and persisted with a similar aftertaste for several seconds, then tailed off gradually. Tasting notes printed on the packaging read: "...dried fruit with low bitterness and astringency, and an almost immediate balance." 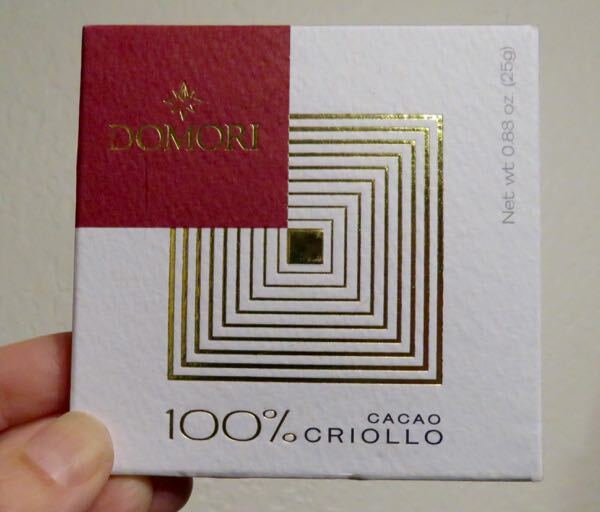 It was all of these, but without some of the more delicate dried, fruit acidity at the beginning that is ofter present with bars made with pure Criollo** cacao. **Criollo, a variety of cacao, is known for its subtle, exquisite, usually balanced flavors. Fruits for this tree tend to be slightly smaller, and it is often more delicate, and less disease resistant than Forestaro and Trinitario varieties.